Earlier this month, the American Board of Internal Medicine (ABIM) announced new members to its Board, Council, Specialty Boards and Exam Committees who will join our efforts for continual improvement to meet the needs of today’s physicians. Currently, ABIM has nearly 400 volunteer members. Almost all (93 percent) of ABIM governance members are physicians, and the remainder (7 percent) are public members who bring a patient/caregiver perspective. Nearly half of ABIM’s physician governance members spend most of their time providing direct patient care. Each subspecialty board has two or more non-internist (public) members, including a member of the interprofessional health care team and a public member with a patient/caregiver perspective. The Council has two public members. The Board of Directors currently has two public members. When ABIM first began in 1936, it was governed by a nine-member Board of Directors. Half of the membership was selected by the AMA and the other half by the ACP. More than half of the members had to be at the rank of Full Professor in a U.S.-accredited medical school. During the ensuing decades, ABIM’s governance evolved, reflecting the changing health care landscape and the need for ongoing physician certification. As a member of the ABIM Board of Directors for the last eight years and its current Chair, I am proud to be a part of the many recent changes the Board has initiated to make ABIM more reflective of and responsive to our physician community. Over the past four years, ABIM has restructured its governance to allow for more agile, future-focused decision-making, to better reflect our diverse diplomate population and to bring in important voices from around the internal medicine community. The Board of Directors has delegated areas of deliberation and authority to the new Council and 12 Specialty Boards, which in turn align the work of Exam Committees toward cross-disciplinary goals. Just as important to the structural changes of ABIM governance is the selection of members that populate the various boards and committees. For several years, the recruitment of physician members has targeted candidates who are in community practice and spend the majority of their time in direct patient care. 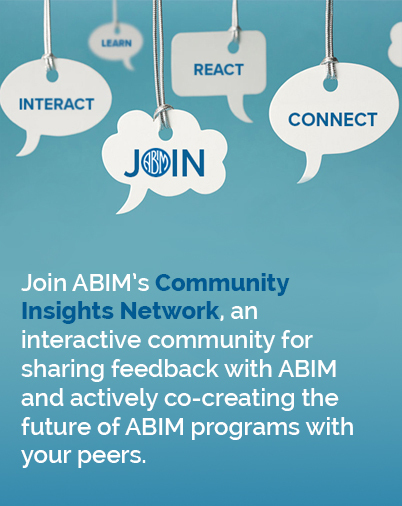 Embodying a diversity of perspectives throughout all of ABIM governance is vital to meet our community’s demand for relevancy. Members serving from all over the country incorporate what they hear from their colleagues about the organization and its programs—particularly Maintenance of Certification (MOC)—into proposals for changes, some of which have already been implemented. The touchstones for all governance decisions are encompassed in ABIM’s design principles, which serve as a guide for setting ABIM policy, determining components of Certification and MOC, setting assessment standards across disciplines and creating medical knowledge modules, among other decisions. All members of ABIM governance entities must comply with the Board’s Conflict of Interest and MOC Participation policies. ABIM transparently shares biographical and disclosure information for each member on ABIM.org. In the coming year, ABIM’s governance members will continue to work alongside their peers and members of the internal medicine community to transform ABIM’s MOC program. I am grateful for their important service, and I thank the thousands of ABIM Board Certified physicians who have been working with us to update MOC and share the belief that there should be meaningful standards in place, designed by physicians, to ensure accountability to the public. We plan on introducing you to more members of our governance on the blog in the future. I encourage you to share your thoughts with me and Dr. Baron, to subscribe to the Transforming ABIM blog and to sign up for opportunities to get involved.